About a month ago I volunteered to host an Eat-In at my shop, Fancifull, in Hollywood. It was part of a Slow Food U.S.A. Campaign to bring attention to the deficient Child Nutrition Act that is coming up for renewal before Congress this year. The plan was to have a string of Potlucks across the U.S. all happening on Labor Day. We wanted to show Washington that there was a movement, that people cared about childhood nutrition. The dining tables were draped in burgundy and beige fabric and lined with bowls of sunflowers. Other tables stood nearby ready to be loaded with food from the guests. The computers were up and ready for people to sign our Child Nutrition Act petition, Sting was singing Brand New Day via my Ipod, a station for writing letters to legislators was readied with paper and pens and phones lined the end of the table with phone numbers of all the legislators from all the districts. We had posters made of some of the alarming facts: Childhood obesity has tripled in the last 20 yrs, Diabetes is becoming epidemic, The Child Nutrition Act as it stands now does not protect children from too much fat, sodium and sugar in their diets. Now we just needed people to show up. Show up they did, a steady stream throughout the three hour event. Vegetable Chili, quinoa with corn and feta, potato salad, vegan dip, tomato salad, just some of the savories that were so generous we had to spill out to more tables. Z Pizza sent up six organic pizzas and salad. The Village restaurant down the street made a huge tray of seafood salad along with an equally big tray of custard in phyllo. We drank lemonade from the Larchmont Larder. Wow. We could eat for days. There is a beauty to a community coming together to support a cause. This was a disparate group, not just my friends or clients, or friends of volunteers. No, these were people who received a flier at the Farmer’s Market, mom’s with kids who knew too well that school children need better nutrition, local business people, individuals who were seeking a group; who were willing to belong and contribute. Children and adults made “veggie” people and wrote letters. Laughter and good conversation bounced off the walls. It was thoroughly delightful. We discussed the alarming statistics. But more importantly we offered solutions. We had Chef E from the Farmer’s Kitchen who is setting up organic food programs for schools in Los Angeles. Home Girl Cafe was represented. They not only have their own organic gardens that they use for many of their dishes, but with the motto, “Jobs not Jail” are giving kids a better game to play and more importantly a future. Then we had my favorite renegade, Megan, from Root Down L.A. She brought her DVD showing the Root Down and other programs that not only get kids out to the farms so they can actually see what whole foods are, but then filmed them cooking it and learning how good broccoli can be when it is blanched and a little salt is added. She worked the crowd up with her enthusiasm. We had several showings of her film in our “theater” which elicited cheers and applause each time. A representative from Senator Curren Price’s office showed up and was grilled by the attendees. When Slow Food U.S.A proposed this idea just a few months ago, I don’t think anyone thought it would transpire into over 300 events across the U.S. on Labor Day. That is one big community. And we are all the better for it. 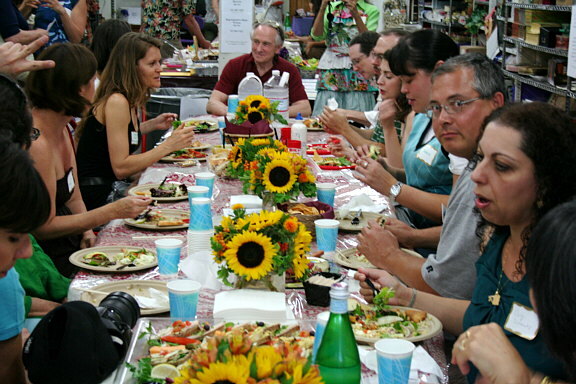 Slow Food is having a membership drive this month, September only. You can join for whatever you can afford. The normal membership is normally $60, but pay what you can. In order to affect change, we need members. Take advantage of this great opportunity.